I decided to make baked salmon for dinner. A bit of lemon, green onion, and some fresh herbs from the garden would make for a taste main dish. I decided that noodles Florentine would be a good side to go with the salmon. 1. Pre-heat the oven to 400º F.
2. Scale and rinse the salmon. 3. Cut slashes into both sides of the salmon about an inch apart. 4. Slice a few rings of lemon from the middle of the lemons. Squeeze the juice from the end pieces into a small bowl. 5. Add the olive oil to the lemon juice and mix it up. 6. Rub the oil and lemon juice over the salmon, inside and out. 7. Season the salmon lightly with pepper and salt, inside and out. 8. Lay 2-3 slices of lemon in the cavity and top them with the green onions and thyme. Tip: You do not need to remove the thyme leaves from the twigs. 9. 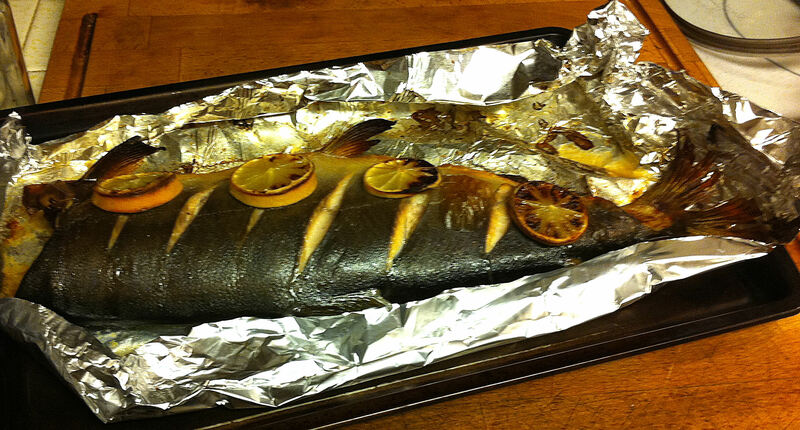 Lay the salmon in a shallow baking pan and garnish with several slices of lemon. Tip: Although it is ecologically unsound, a sheet of aluminum foil makes clean up much more easy. 10. Bake for 20-30 minutes, until it has started to brown and the meat flakes easily at the thickest part of the fish.